What is ePicas and what are the benefits of using ePicas? ePicas is a software package that enables you to view LIVE availability on our website and place availability or pre-book orders at any time of the day or night. 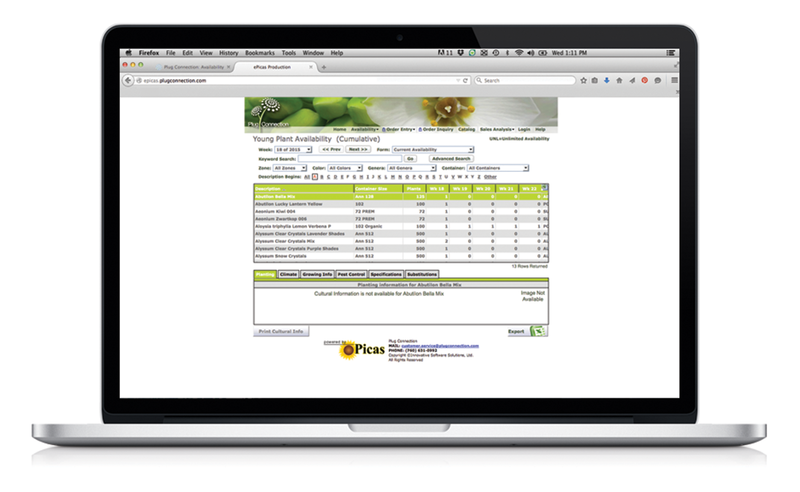 ePicas also offers an Excel download option and the ability to look up orders, order status and tracking numbers. What type of orders can be placed through ePicas? How often is availability updated? Plug Connection’s ePicas availability is LIVE and updated whenever a transaction occurs. Feel free to call us at (760) 631-0992 or email us with any questions. Conveniently check online by logging into ePicas “Order Inquiry” and see LIVE tracking information, or call your broker or Plug Connection during normal business hours. Can changes be made to orders? Changes can be made online anytime before Friday at noon the week prior to shipping. What tray sizes are on availability? Do you backorder products that I could not get when I placed my order? Only when necessary. With Plug Connection’s ePicas availability, you rarely have to worry about your order being sold. Because ePicas is LIVE, you know exactly what you are going to get. Why should I NOT order a partially filled box? It is not recommended. With extra space in the box, the risk of damage during transit is high. A surcharge will be applied to unfilled boxes. No claims will be honored on partially filled boxes. What is the minimum I need to order? Plug Connection’s ePicas availability and pre-book orders must fill one box. Can I order from current availability and have it shipped the same week? Yes, if the product is available THIS week and booked on Monday by 4pm PST. Do I need a user ID and password to login to ePicas and how do I get my login info? Yes. Click HERE to request your Plug Connection ePicas login ID and password. Who is notified when an order is placed? Plug Connection will send an acknowledgment to broker and customer (if applicable). Who can place orders through ePicas? You or your broker. View broker list. When can availability orders and pre-booked orders be placed? Plug Connection’s ePicas availability is accessible 24/7—Any time of the day or night.